If you're trying to decide between "Rio 2" and "Draft Day" this weekend, stick with the football. 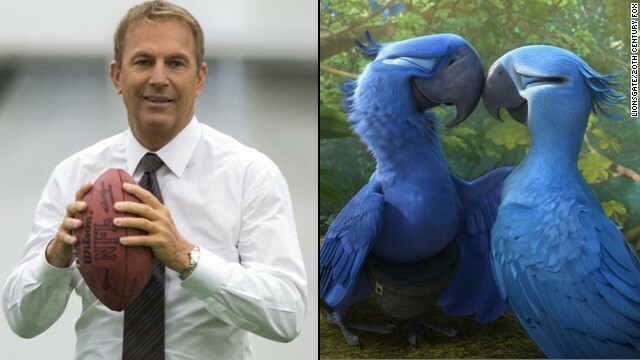 According to critics, Kevin Costner's new heart-warming sports flick isn't a bad way to spend a few hours - or, at the very least, it's slightly better than revisiting the talking birds in 2011's "Rio." In "Draft Day," Costner plays Sonny Weaver Jr., the fictional general manager of the Cleveland Browns who's under pressure to make the right choice on the day of the NFL draft: does he go with the undeniably talented quarterback that'll make "the splash" his boss is demanding, or does he pick one of the other two players he's had his eye on? And, just to complicate things, his girlfriend/co-worker (played by Jennifer Garner) announces she's pregnant. As directed by Ivan Reitman, The Hollywood Reporter found "Draft Day" to be "almost always engaging and seemingly true to the world it depicts," although it was "never quite as funny as you somehow think it's going to be" mainly due to Costner's thoughtful approach to his beleaguered character. The New York Times' A.O. Scott had more reservations. "The spectacle of guys in suits making deals is ... pretty entertaining, and while this film doesn’t have the fussy authenticity of 'Moneyball,' it does offer a reasonably clear and convincing glimpse of the business of big-time sports," he says in his review. "I don’t really buy 'Draft Day' — it’s a shallow and evasive movie, built more around corporate wish fulfillment than around reality — but I have to say that it sells itself beautifully." If you're not really a football fan - or a fan of the leads Costner and Garner - there might not be enough razzle-dazzle here to hook you. "'Draft Day' is never terrible — one suspects the NFL wouldn't have been so generous in licensing official league images if they hadn't ensured there would be a baseline of crowd-friendly professionalism," says NPR. "The movie is loaded with all the star cast members and glossy sheen that money can buy. That's almost enough to hide just how aggressively mediocre it is underneath." And if you have kids, "Draft Day" probably isn't going to handle a candle in comparison to the brightly colored, singing macaws in "Rio 2." With Jesse Eisenberg and Anne Hathaway returning to voice the two lead love birds, the pair first introduced in "Rio" have since expanded their family and find themselves trading in their urban life for the rainforest. And Corliss isn't alone. "'Rio 2' teems with colorful animated splendor and elaborate musical numbers, but (the) rambling, hectic - if good-hearted - story is for the birds," clucks USA Today's review. The Boston Globe, too, was disappointed, saying that a large part of the charm of the first film was "the personal stamp of its director, Carlos Saldanha." While Saldanha also helmed the sequel, somehow it "feels less personal and more like a case of Saldanha's team working hard - too hard - to concoct a tropical blend with an equally pleasing kick. ... It's fun in stretches, but also busily forced." So what are you seeing this weekend: "Draft Day," "Rio 2" or something else? Leave your review below!